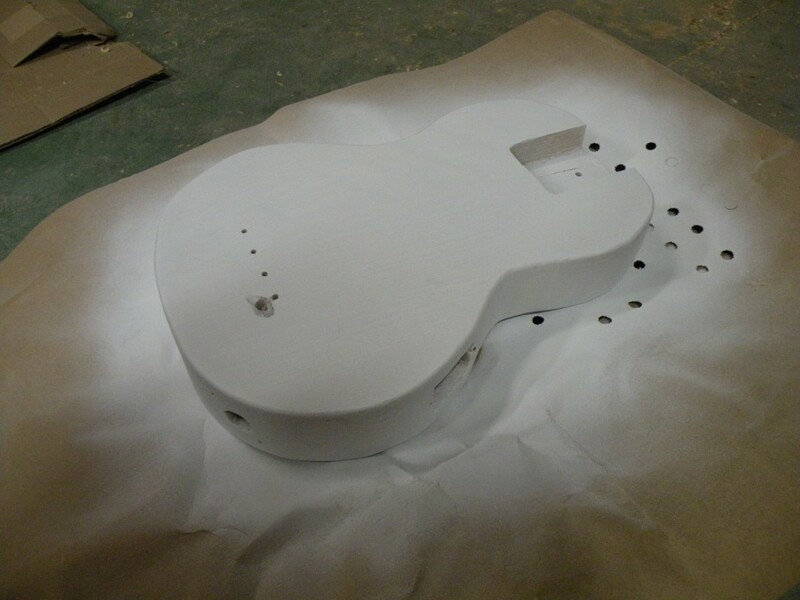 Bass Ukulele Build : part 03 – Complete! 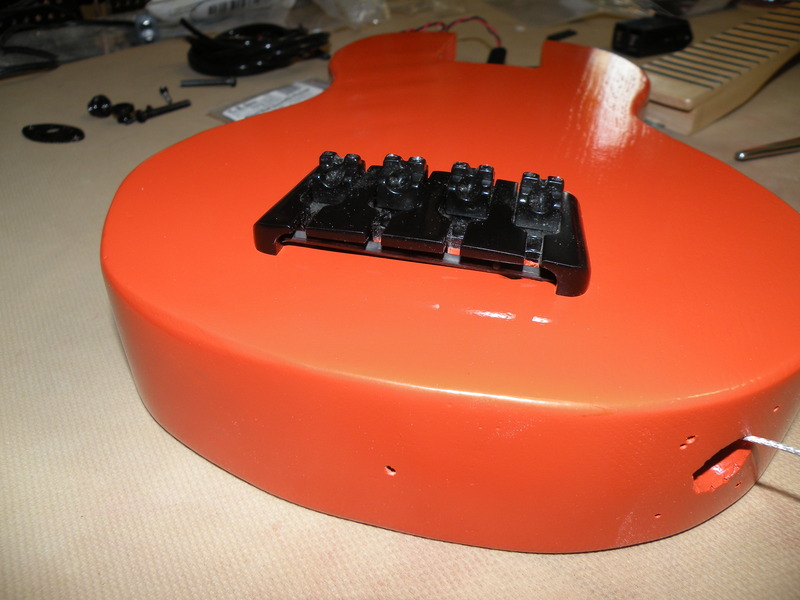 The body was given an orange color and a clear coat. An extra long locking clamp (e.g. 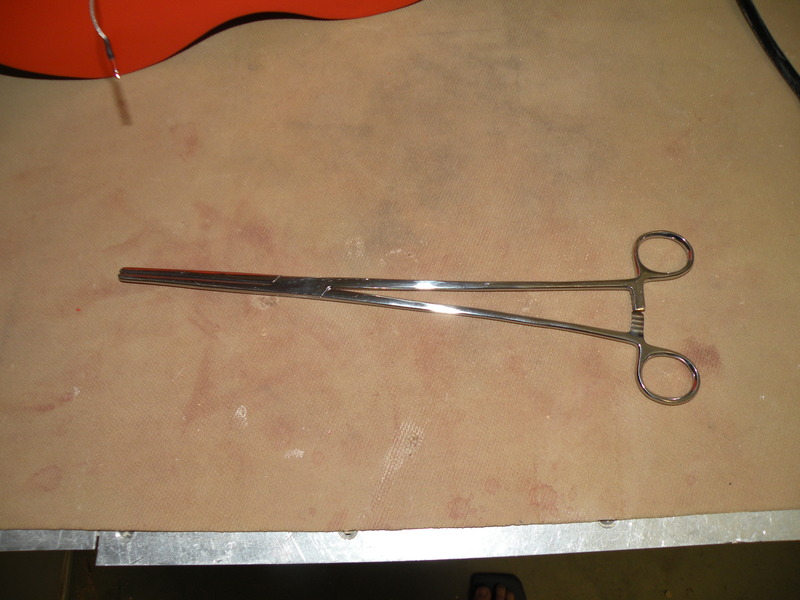 a non-medical hemostat) was used to thread the wires through the body. The preamp cavity was narrow and deep, so this tool helped out tremendously. I originally thought that the rod piezo would be tucked into the space at the back of the bridge. After some testing, this setup wasn’t working as well as I wanted it to. The weight of the wood and the bridge dampened the sound too much. After putting the rod piezo right behind the string saddles, the sound was much more responsive. The neck was attached with an oval jack plate. (This seems to be a signature feature of my electric instruments.) A strap peg was placed in the middle of the plate. The battery compartment was installed in its place at the bottom. The smaller preamp and the battery holder work together to make a great setup for this bass ukulele. There are no onboard volume or tone controls, but those things are easily controlled on the main amplifier. This bass ukulele turned out great. I was worried about my color choices when I started out, but I think it looks awesome. This little ukulele also produces nice sound. The Road Toad strings have a really nice feel to them, and they help make sweet music. I met all of the goals that I had for this project. I now have a slick little instrument with great sound and looks to match. This project was a rousing success! Check out the deep and rich sound that this little bass puts out. The body is made of ash. The neck was made with three pieces of maple. 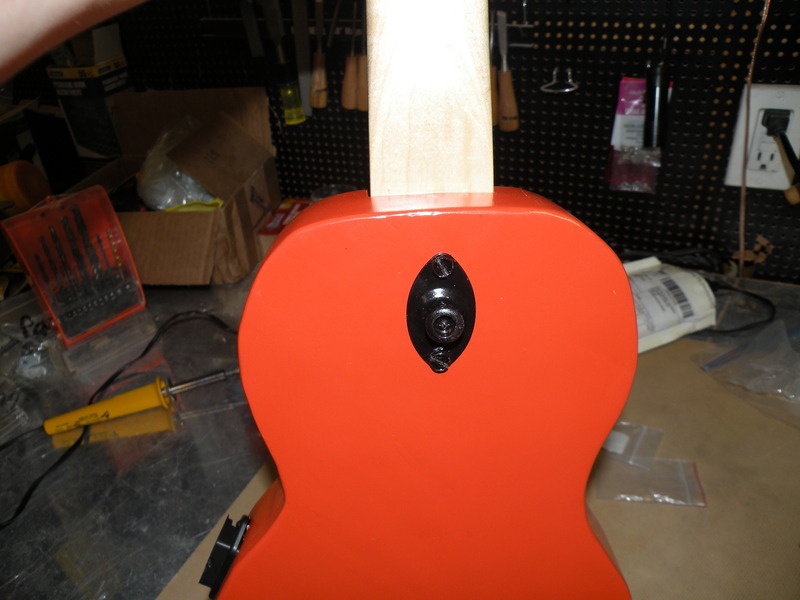 The headstock was scarf jointed to the neck and the fretboard was glued to the top. I got the specialized tuners and nut from https://www.largesound.com/buy/. They provide replacement parts for Ashbory Basses. The bridge is a knockoff “Hipshot A Style” bridge. 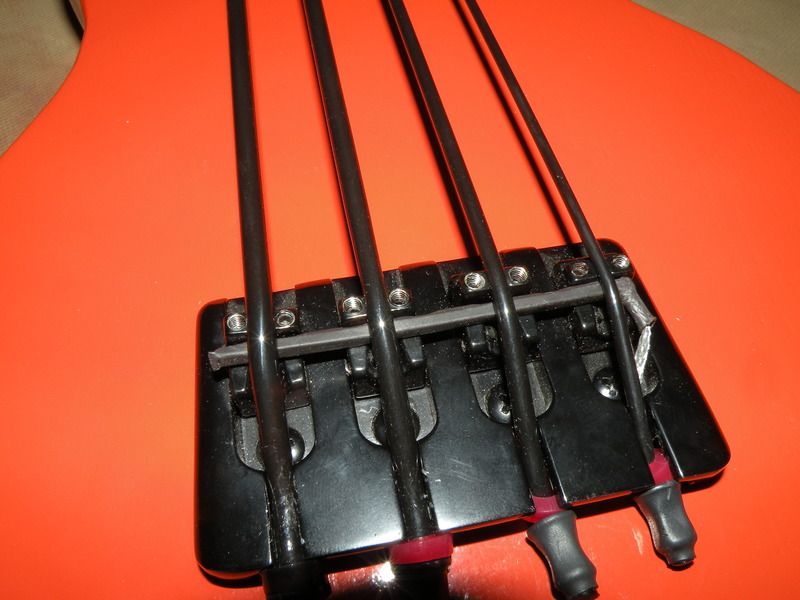 This type of bridge allows for the mounting of the thick “Road Toad” strings. I sealed and primed the body. 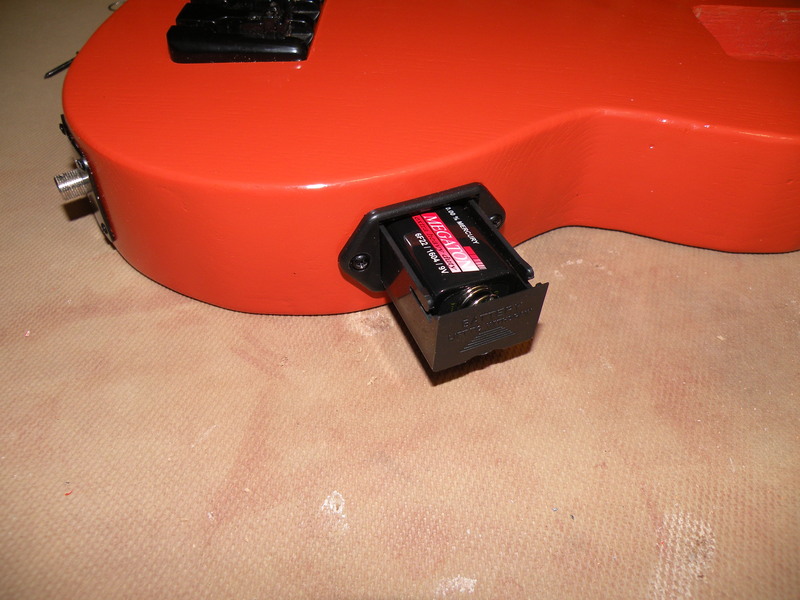 I drilled a larger hole by the the bridge to allow a rod piezo pickup to be mounted by the back of the bridge. With a drill and a chisel, I hollowed out a cavity for a 9V battery holder. 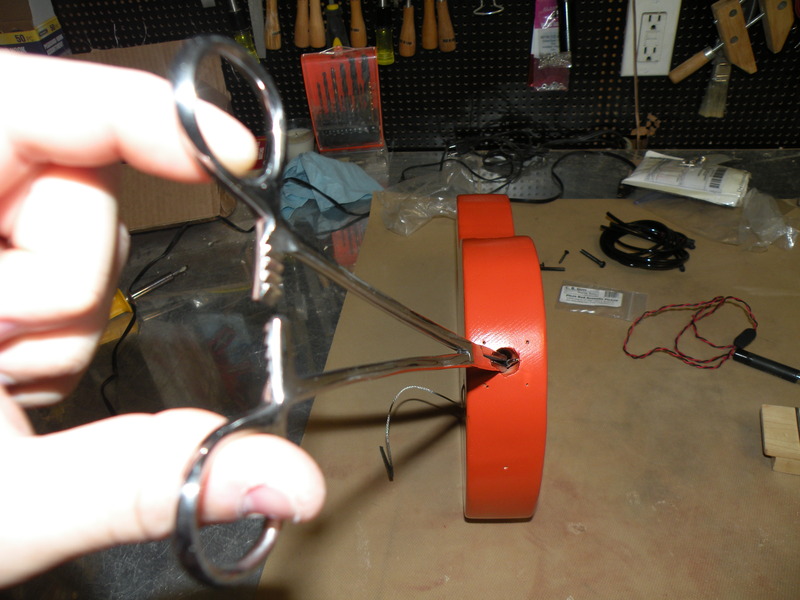 This bass ukulele will have an active pre-amp to boost the low output of the piezo rod. 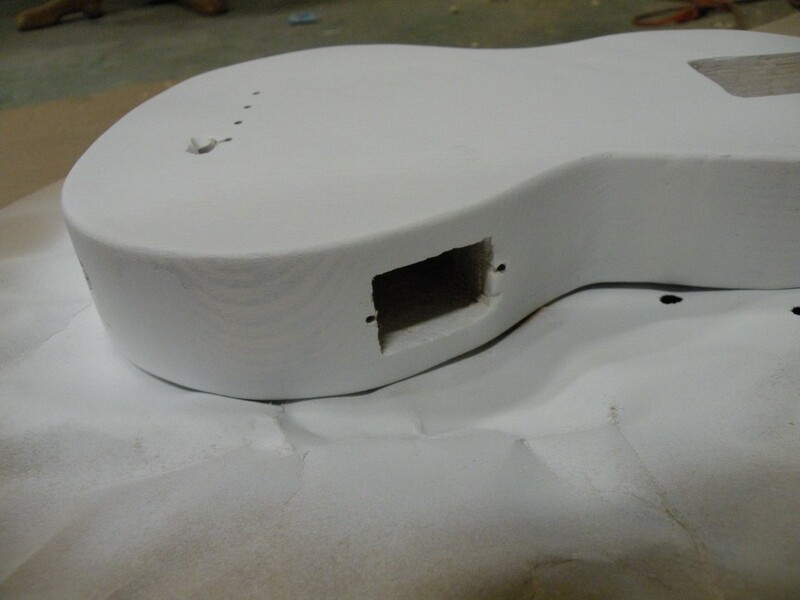 The neck was given a nitrocellulose lacquer finish after side markers were installed. 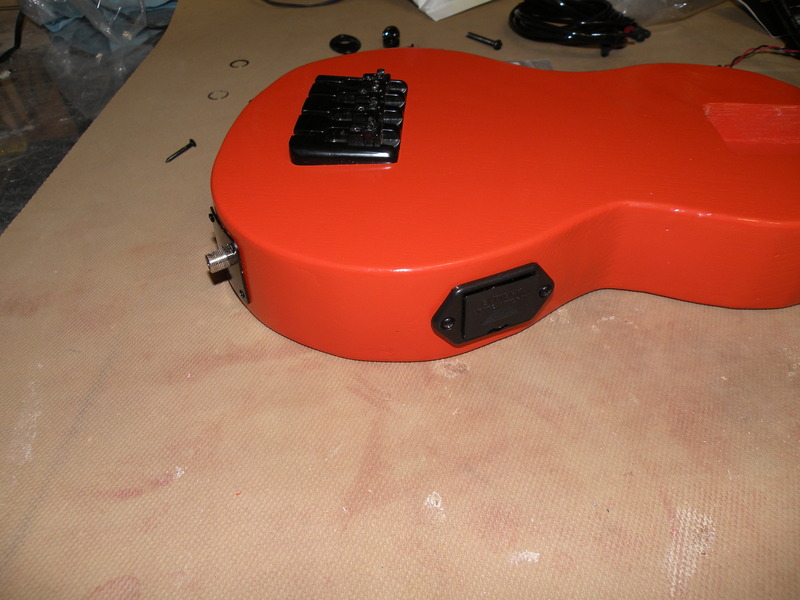 Next, the body will be given a beautiful orange finish. Once the color and clear coats have cured, it’ll get a good buffing and polish. Finally, my favorite steps will arrive. That is assembling and playing the instrument. There is something almost magical about the first tune on a brand new instrument. I want a bass ukulele. After building a few dozen instruments, the thought of simply buying one from store seems very boring. 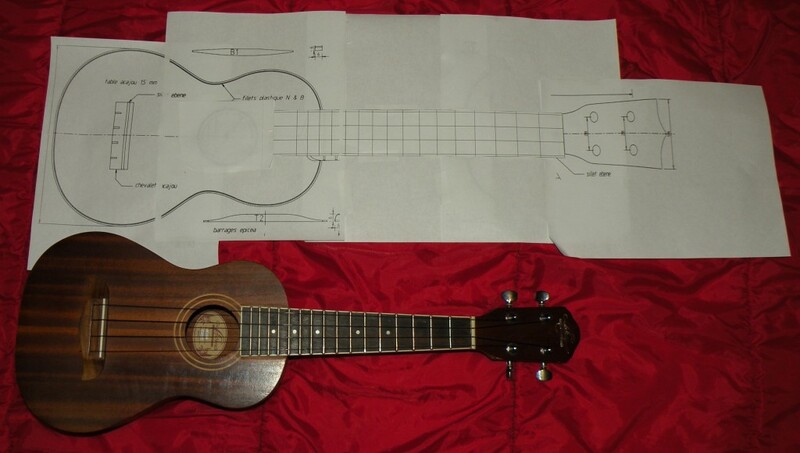 I will therefore expend the time and money to make a custom bass ukulele that will fulfill my desire. The combination of orange, black, and maple should make for an interesting looking instrument. I hope that I don’t live to regret making a bright orange ukulele. Hopefully, a funky color will look good on a funky ukulele.